I love having some type of pickle to serve with sandwiches, or even to serve as an accompaniment to a southern dinner. This is a sweet pickle that works well with either of those or just as a snack. If you have never tried a diakon radish, you should. They have a wonderful crunch but are not spicy like the radishes we are accustomed to eating. Wash and peel the diakon. Thinly slice the radishes about 1/4 inch thick. If you have a mandolin, that would be perfect. However, I gave mine away because I seldom used it. I used my meat slicer and it worked wonderfully. 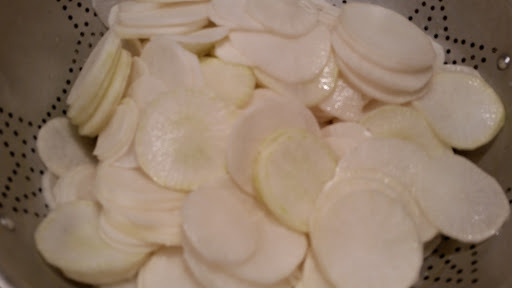 Place the radishes in a strainer over a bowl and add the salt. Let it r, sugar, and turmeric to boiling. When the sugar is dissolved, remove from the heat and let it cool. drain for one hour. Rinse well with cold water. 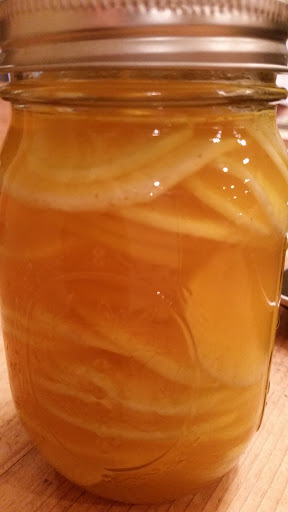 In a medium saucepan, heat the vinegar, water, sugar, and turmeric to boiling. When the sugar has dissolved, remove from the heat and let cool. Place the diakon slices into jars. Pour the cooled vinegar mixture over the radishes and place your lids on top. These need to be refrigerated at least 4 hours before eating. Overnight is even better.